The number for The Netherlands costs € 1.30 per call and you'll receive 10 text message credits. This makes €0.13 per text message. In Belgium, a call is slightly more expensive (€1.50), but you'll get more credits (13) which eventually decreases the price per text message to €0.12. I've compared and here in Belgium pre-paid text messages for Windows Live Mobile Messaging -the text messaging service built into Windows Live Messenger- cost five cents more: €0.17 per message if you buy a pack of 12. And that's the only message bundle you can buy just by calling or texting a service number without the need of a credit card. If you do own a credit card, pricing is the same as Floor's: €0.12 per message if you buy at least 25. In that case it's just a matter of which service you find more convenient and how many text messages you'll be needing. 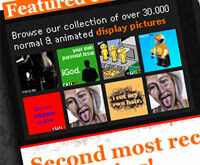 Check this out: the kind people of Floor are offering 10 Messers a free bundle of 20 text message credits. 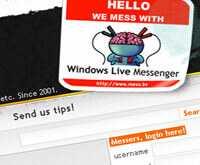 A window asking for your Messenger address will randomly pop-up to visitors of SMSmetFloor.nl who come via Mess.be. Enter your address and you'll get the free credits. Let me know if you're one of the lucky winners, so I can follow up on this giveaway. We're currently experiencing some problems with our download section, which you can't browse nor retrieve any files from at the moment. We're hoping to have it fixed in the next 24 hours. Meanwhile, sorry for the inconvenience. UPDATE: The issue should be fixed. 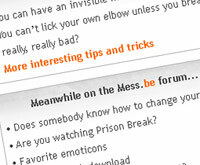 Please let me know on the forum if you're still experiencing problems. I first heard about Demetri Martin when he did this little skit on Windows Vista two years ago. Then a few months back when I was in the States, I saw his show on Comedy Central and I've been a fan of the young comedian/actor/musician/writer ever since. Seeing this video again recently inspired me to turn a few of his "art masterpieces" and "flip chart findings" into Messenger display pics. There are 18 of them right now, but I might add some more later. While they're half funny on their own, I advise you to check out that video to see where they're coming from. >> Browse all 18 Demetri Martin Flip Chart Jokes. If I had the cash and if I didn't love my iPhone so much, I'd be very tempted to get me the X1 (short for Sony Ericsson XPERIA X1). Like I said when it was first announced, it seems to be the ultimate Messenger phone: a slide-out keyboard, Windows Mobile 6.1 with its almost perfect mobile version of Windows Live Messenger... and so damn slick-looking. Earlier this month a special Windows Live panel was released which syncs your Windows Live contacts and those in your X1's phonebook, and provides access to Hotmail, Windows Live Messenger and a voice-activated/controlled Windows Live Search. 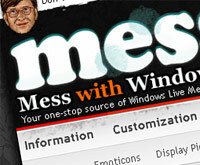 More Windows Live services will be added to the panel later on. >> Download the Windows Live Panel for free from SonyEricsson Fun or directly to your Xperia by going to www.sonyericsson.com/fun. Note: The X1 was released to limited markets only. Look here for worldwide release dates. - "Another version of the product is already installed"
- "Your computer has a newer version of MSN Messenger than the one you are trying to install"
- "Your computer has a newer version of Windows Live Messenger than the one you are trying to install"
- "The feature you are trying to use is on a network resource that is unavailable"
- The application is not listed in the Add or Remove Programs window. - The installer is damaged with a Catastrophic failure (0x8000ffff). - The Windows Installer is prompting for a missing .msi file. First, ZapMessenger attempts to uninstall Messenger the regular way, but if that fails it will forcefully remove it from the Windows Installer engine without leaving any tracks. Rest assured, it does NOT delete your custom emoticons, backgrounds, display pictures and the like. No installation is required, just run the executable inside the archive. Note that the .NET Framework 2.0 or above is required to run ZapMessenger (you can get it for free here if it's not yet installed on your system). >> Need support for ZapMessenger? Get in touch with Jonathan here.